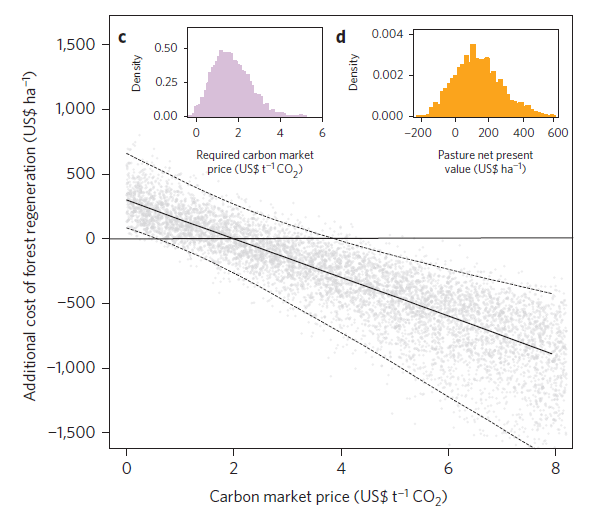 Although species richness is most ecologists go-to metric to ‘take the temperature’ of an ecosystem, it is not always the most useful. Even when species richness doesn’t change much over time many species may be being added to or lost from a community. Changes in human land use can cause loss of a particular taxonomic or functional groups, which can have important implications for ecosystem processes such as pollination or seed dispersal. This non-random loss of species as a result of human impacts can result in biotic homogenisation – where the communities in different location become more similar to each other. Biotic homogenisation has been seen all over the world in response to drivers like urbanisation, agricultural land-use change, and eutrophication. However, up until recently, there had been little work on how biotic homogenisation impacted multiple taxonomic groups across landscapes. Work has also been almost entirely carried out at a single spatial scale. Given that taxonomic groups are likely to differ in their response to disturbances and that landscape scale processes may play a critical role in species persistence. Fortunately last week a paper was published by Ricardo (aka Bob) Solar and colleagues in Ecology Letters that attempted to fill these knowledge gaps. Specifically the paper attempted to determine how much of the change in community composition as a result of changes in tropical forest land-use change were attributable to replacement of species (termed turnover) and loss of species (termed nestedness). Bob and his colleagues did this for birds, dung beetles, plants, orchid bees and ants at 335 sites (!) in 36 different landscapes in 2 regions of Brazil. The sites used were either primary forest experiencing varying degrees of human disturbance, secondary forests, cattle pasture or arable farmland. The importance of loss of species (nestedness) in biotic homogenisation increased as intensity of disturbance increased at both (a) local and (b) landscape scales. Taken from Solar et al. 2015. For me, the most interesting message of the paper the changes in community composition were largely attributable to replacement of species. This suggests that as species are lost following disturbance, colonisation of generalist species initially causes relatively little change in species richness. However, as land-use intensity increases the contribution of species loss to alteration in community composition became more important suggesting that communities in these locations tend to be made up of generalist species that are tolerant to human disturbances. Conversion of forest to agricultural use led to much greater biotic homogenisation than degradation. Photo courtesy of Bob Solar. Interestingly, the paper also shows that provided that forest cover is maintained there was relatively little biotic homogenisation. So while it is obvious from previous work that the maintenance of undisturbed forests is vital to conserve tropical forest biodiversity, it is also obvious that degraded forest can play an important role in conservation. This is especially true where few undisturbed forests still exist or degraded forest is widespread such as in SE Asia and Central America. This work effectively shows that taxonomic homogenisation is occurring at multiple scales as a result of human land-use change. The next step is to see what types of species are being lost/retained. This means looking at the interaction between species traits and the land-use gradient (see more on that here). 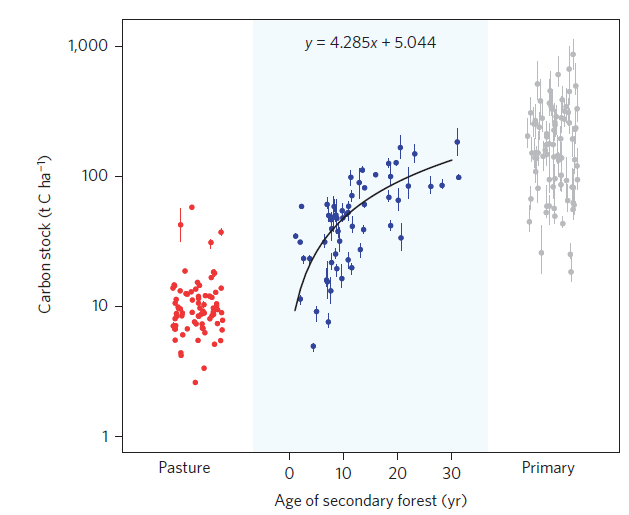 Previous work has suggested that body size and feeding preferences may play an important role in determining whether bird species can persist in degraded forests. Looking at this will allow us to gain a greater understanding of how biodiversity change may alter ecosystem processes and ultimately the ecosystem services on which we all depend. An area bigger than the entire Indian landmass is now used for timber production in the tropics. This logging is largely selective and leads to degradation with loss of specialist species and ecosystem services like carbon storage. However, many have also argued that these forests should be considered a priority for protection since they are at danger of conversion to other land-uses such as agriculture. 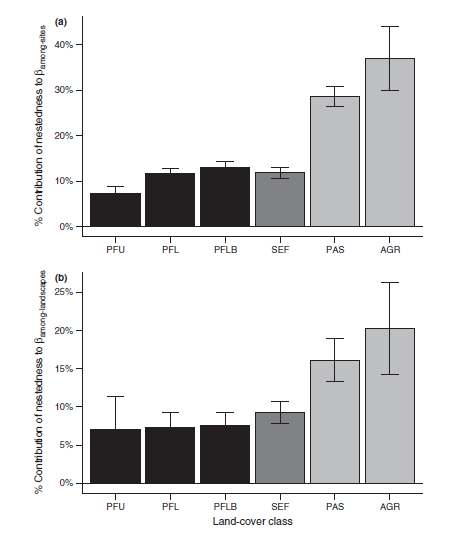 In addition the impact of logging on tropical forest biodiversity appears to be less negative than other human impacts. However, simply saying that logging is a less damaging option when compared to other way in which humans exploit forests misses a lot of what is going on. Logging operations differ massively from place to place in terms of the volume of trees cut for timber, the area affected by logging, the distance between logged and unlogged areas, I could go on… All of these differences have the potential to influence the the effect of logging on biodiversity. 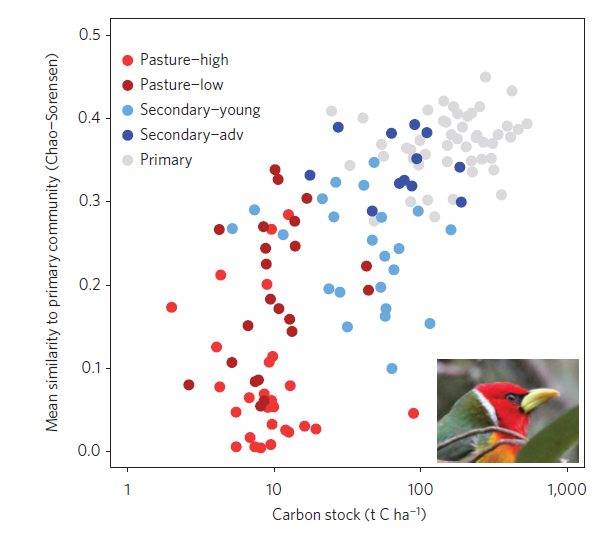 What traits drive response of birds to tropical land-use change? Everyone pretty much knows about the crisis of biodiversity loss facing the tropics. In case you missed it tropical forests are being rapidly cleared, which human population increases and along with consumption. 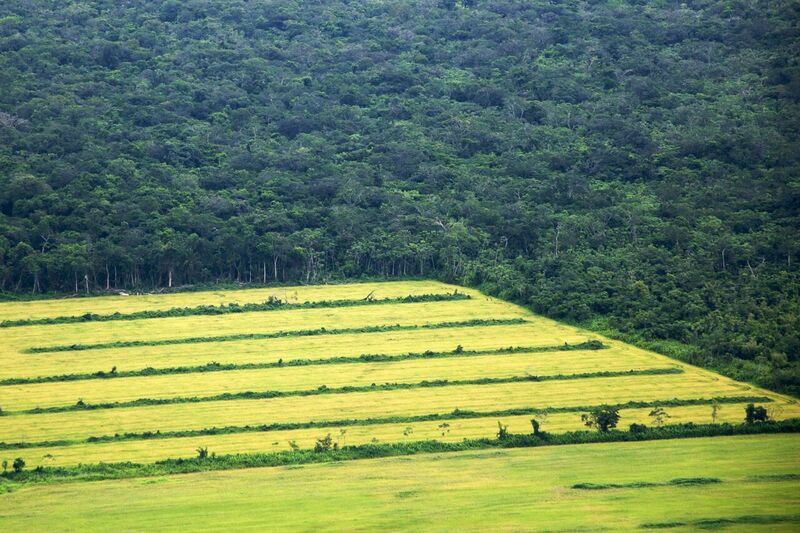 All this has lead to large losses of biodiversity in the tropics. However, up until recently we didn’t have much of an idea how the characteristics of species in the tropics influenced their response to land-use change. ‘Why would we want to know that?’ – I hear you ask. Well if you’ve seen my blog before you will know that traits are a good way of linking biodiversity change to changes in ecosystem function and services. This is the first step to working out the consequences of the massive changes in biodiversity we have seen over the last century. Simply put – we need to know this stuff. Given what I think, it was great to find out at the recent BES 2012 annual meeting in Birmingham about a paper looking at how bird species with different traits respond to land-use change in the tropics. Tim Newbold, a postdoc at the World Conservation Monitoring Centre in Cambridge, and colleagues compiled an impressive dataset of >4500 records of >1300 bird species from 23 studies of land-use change in the tropics. They then used data on habitat preferences, migratory status, diet, generation length and body size to determine how differences in these traits related to birds’ response to land-use change. They found that long-lived, non-migratory, primarily frugiverous or insectivorous forest specialists were likely to be less abundant and less likely to occur in intensively used habitats. Of these characteristics diet preference is perhaps the most easy to link to changes in ecosystem function and services. The loss of insect eating species may impact the control of pest species with potentially negative consequences for tropical agriculture. However, this assumption depends heavily on pest species abundances not reducing in line with bird declines. It is also entirely possible that if pest species also reduce in abundance forest loss will lead to little change in crop damage. The reduction in fruit eating bird species may have consequences for forest regeneration and maintainance of plant diversity. Many secondary forests that are isolated from primary forest have been shown to lack large seeded tree species. Any reduction in the abundance of fruit eating birds suggests another barrier preventing the recovery of plant species communities in secondary forests.